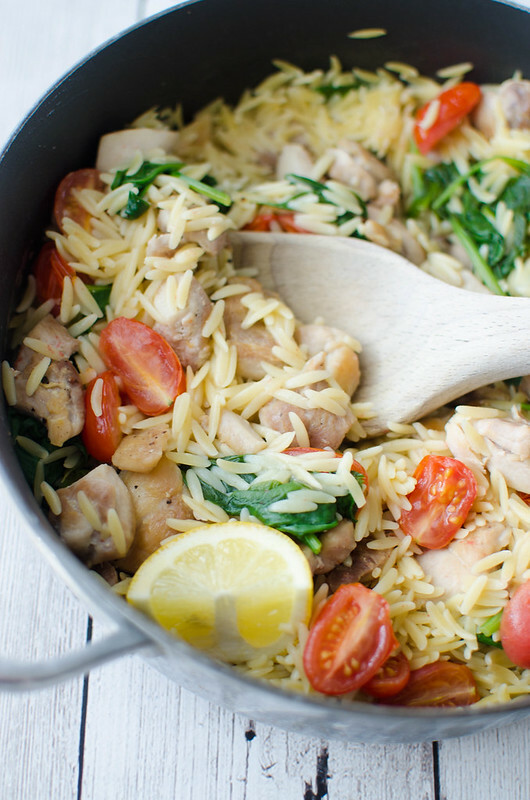 One Pot Lemon Chicken with Orzo – light, healthy, and delicious! 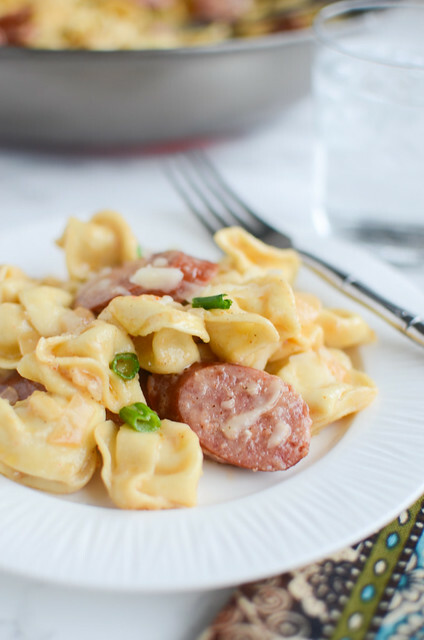 All cooked in one pot and ready in under 30 minutes! 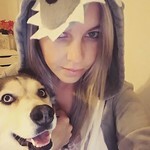 Hi guys, how was the week?! It’s Friiiiday! It got cold here in central Texas this week. One morning it was hot and then by evening I was hiding in the Jeep during soccer practice because I showed up in shorts and a t-shirt since it’s never cold in September in Texas! But you know what that means! It’s finally cool enough to get back to hiking with the husky! Everyone else had the same idea yesterday so the trails were packed but it was so nice to just escape for a few hours. We haven’t hiked since, like, April! Okay, I know we’ve moved onto fall foods and cheesy football dips and we’re already making our Christmas cookie list but I’ve been having this major thing with chicken thighs since I made that sweet potato curry (I even made it again a couple days ago!) and I’ve also been really into pasta lately. I’m also really into quick, easy meals. Things that can be made after soccer practice in the time it takes my kids to shower. Like things made in one pot. That take less than 30 minutes. 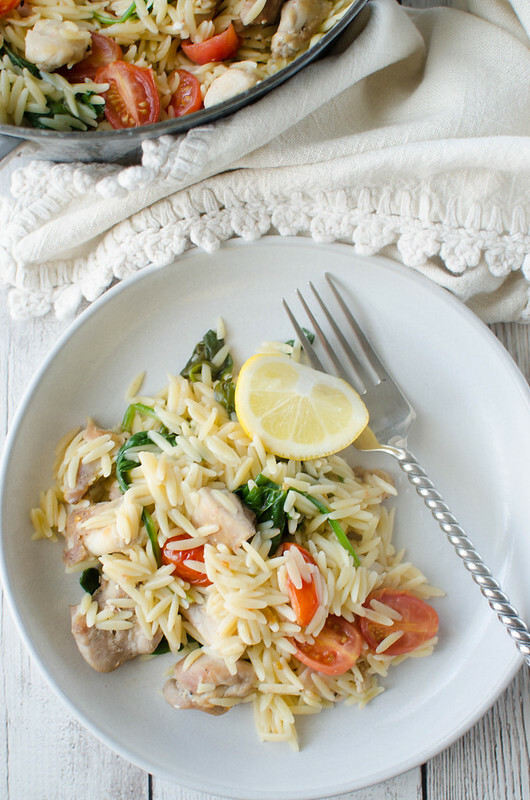 You know, like this One Pot Lemon Chicken with Orzo. 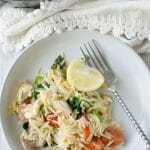 One Pot Lemon Chicken with Orzo! It’s so simple and so easy and some would even say it’s quite healthy. You just cook some boneless chicken thighs (use breasts if you want but thighs are so much better!) and once those are cooked, remove them from the pan and then in the same pan, boil the orzo in chicken broth. 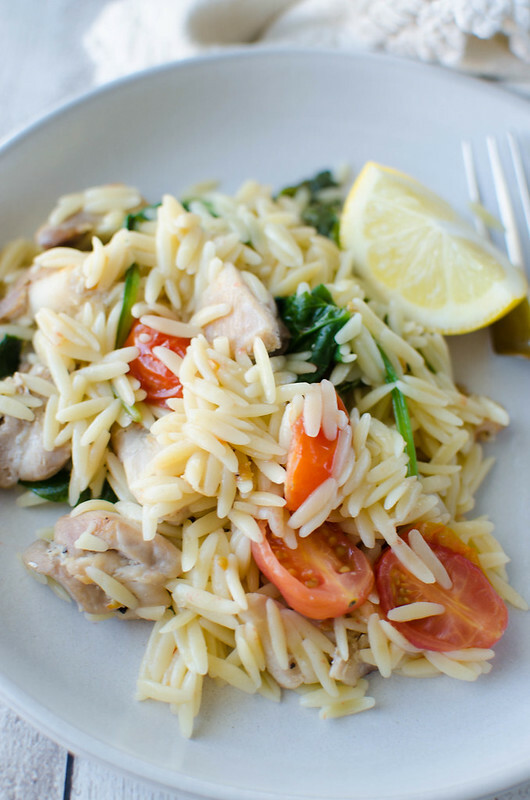 Once that orzo’s absorbed all the broth, stir in lemon juice, fresh spinach, grape tomatoes, and the chicken! 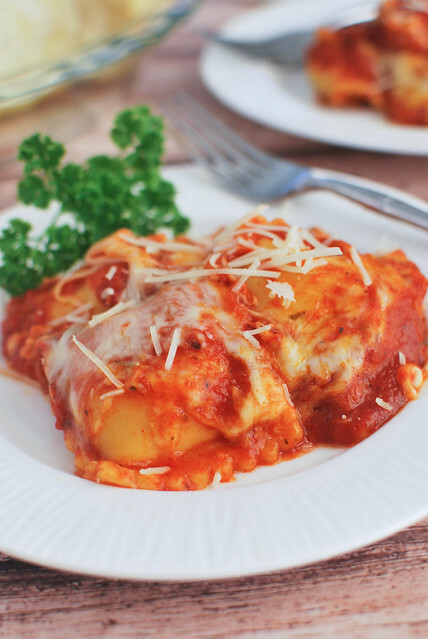 You could totally add Parmesan to the top but it’s perfectly delicious and fresh just like this. My two little ones argued about the leftovers the next day after school. So it must’ve been pretty good. In a large skillet, heat coconut oil over medium heat. Season chicken with salt and pepper and add to hot pan in a single layer. Cook 3 - 4 minutes on each side, or until browned and cooked through. Remove to a plate and set aside. Wipe out pan if necessary. Using the same pan, bring the chicken broth to a boil over high heat. Once boiling, add in salt and orzo. Bring to a boil, lower heat to a simmer, and cover. 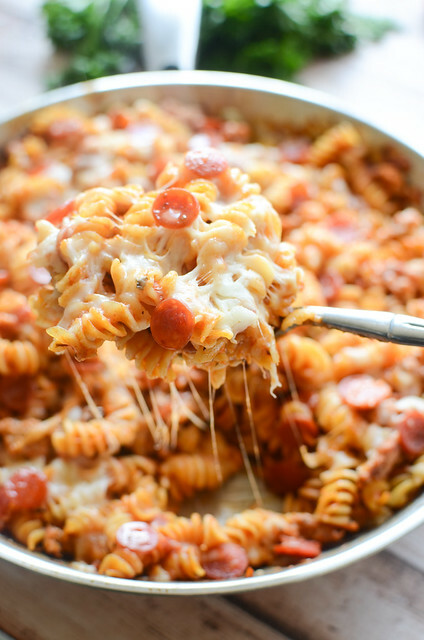 Cook 8 - 10 minutes or until al dente. 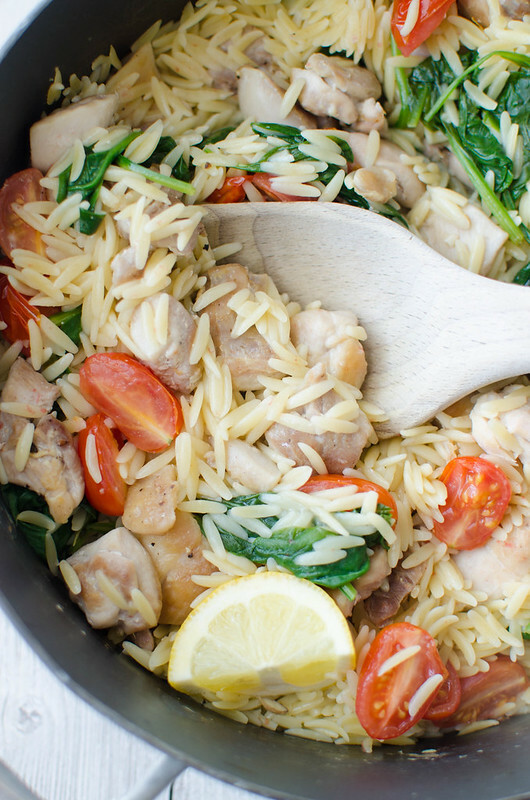 Stir in the chicken, lemon juice, spinach, grape tomatoes.